Tamworth mixed farmer Bryce McMurtrie trades beef for hay making to help boost farm gate profits. TIMING is everything when it comes to farming, whether it’s choosing the prime moment to sell your lambs or the window in the weather to cut your hay. This is deeply rooted in the decision-making of Tamworth mixed farmer Bryce McMurtrie, who knew he needed to switch up his 150-hectare operation six months back to remain profitable this season. This meant de-stocking the majority of his steers and sowing 40ha of dryland oats and 80ha of irrigated lucerne and barley in April and May on his property near Loomberah, about 17km south of Tamworth in North West NSW. Bryce McMurtrie checks on his irrigated lucerne crop at "Limestone Park” near Loomberah. 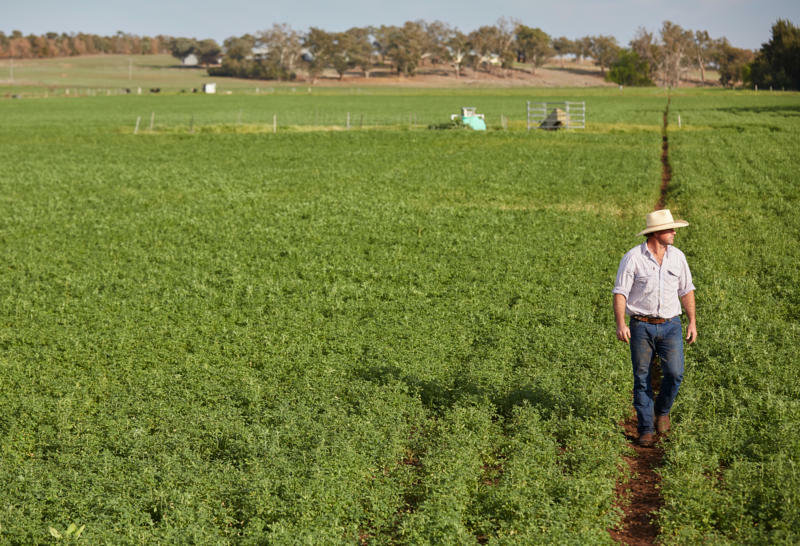 With the lucerne, he hopes to harvest an annual average of 6-8 tonnes to the hectare and fetch between $400 and $650 per tonne – based on solid demand. Bryce says it’s all about key loads – how much cattle are growing a day. “The steers were poking along at 1.8kg to 2kg [weight gain] a day, which is pretty good still, and they’d be hitting mid 2.3kg at point of sale,” he says, but it wasn’t enough for the long term, so he’s channelling his focus on lucerne. There is a premium market with smaller bales, he says, for the likes of hobby farmers and horse owners around Tamworth. Last year Bryce made 3,500 small bales of lucerne and ryegrass, most of which he sold by the ute load (10 or so bales). “There’s a higher premium with that, it’s a lot more work and dealing with a lot more people on farm, but it’s worth it,” he says. Bryce checks the irrigator on a hill overlooking "Limestone Park" . Bryce says he is a novice when it comes to making hay and he wouldn’t be where he is without the help of his friends, neighbours and agronomist. Bryce purchased Limestone Park, a former Dairy Australia optimised irrigation trial site in early 2017. 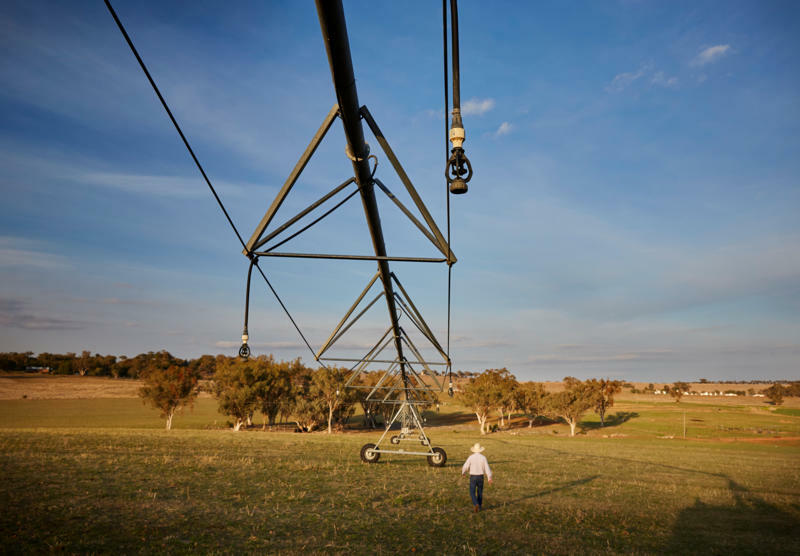 As with any dairy, it had all the infrastructure: two pivots and one lateral move irrigator, phone-operated pumping system, a large (800-bale capacity) hay shed, three 30-tonne silos, an aquifer and a generous water allocation from the Peel River. He’d certainly done his homework. “One of the drawcards of this property was it meant less investment from my end,” he says. Bryce sets the computer on one of his lateral irrigators. “Haymaking is a reasonable skillset and my neighbour is a hay contractor and he makes it well,” Bryce says, adding that everyone’s cost structure is different. But at the end of the day, his haymaking arrangement is what’s boosting his bottom line. It all starts with a mower conditioner that cuts the hay, then it’s windrowed and raked at least three times – or more if it gets wet. It’s about a five-day process, depending on the amount of sun and dew from underneath, and Bryce says he still has plenty to learn. Irrigated Moby Barley field at “Limestone Park” near Loomberah. In the winter, he irrigates during the day to avoid frosts and maximise plant growth. But as it starts to heat up, irrigating happens around the clock. Limestone Park has a 249-megalitre licence per annum from the Peel River, which is at 39% allocation (as of mid-September), and a 212-megalitre aquifer licence based on-farm at 68%. “With the size of my operation that’s plenty,” he says. According to comments Bryce is hearing, particularly from horse people, the quality of hay has dropped in the past six months. “There are a lot of seeds coming from central Queensland and South Australia that NSW might not have had much to do with,” he says. “Limestone Park”, Loomberah: Farm cats, Mick (orange) and Chester sleep on the hay, as Bryce McMurtrie loads small hay bales. It hasn’t all been smooth sailing for Bryce. Last year’s hot summer involved a lot more power costs and water – despite this, his final lucerne cut in January dropped 60% in yield. In mid-September, Bryce said he’d been lucky with the rain, receiving small showers about a week apart over several weeks, which would set him up for a solid harvest. But the forecast is looking pretty dire and, with 40ha of dryland crops, it could be a gamble. If he doesn’t get enough rain, Bryce says he’ll take the seed from the hay as a fallback if it runs to head and there isn’t much bulk. That way, he won’t be left high and dry. Bryce and Sarah McMurtrie’s three children (front to back) Oscar, Charlie and Archie run off some energy in a field of lucerne before going to school.